There is no reason on Earth to disrupt current ways of accessing healthcare under Obama-era rules -- i.e. 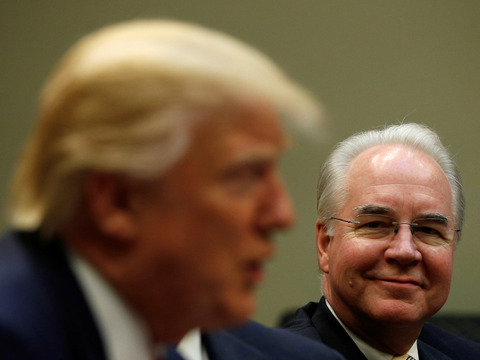 Obamacare -- but the petty, vindictive, hate-driven Trump administration will do it with a vengeance. Is anyone surprised? People will die, but that's the point! The Department of Health and Human Services (HHS) is planning hours-long maintenance shutdowns of the federal ObamaCare exchange during the next open enrollment period, CNN reports. HHS officials said the website will be shut down for maintenance for 12 hours from midnight to noon almost every Sunday of the next ObamaCare enrollment period, which lasts from Nov. 1 to Dec. 15, as well as overnight on the first day of the enrollment period. A spokesperson for an ObamaCare navigator group, which helps people sign up for coverage on the exchanges, told CNN the shutdowns could impact sign-ups. "I could see this really impacting the ability of people to complete an application sign-up in a single sitting, which is so important," Jason Stevenson, of the Utah Health Policy project, told CNN. Those navigator groups had their funding slashed by 41 percent in a round of HHS funding cuts last month. Navigators will now receive funding proportionally to how they fared in hitting their enrollment targets during the previous year. The budget for ObamaCare advertising and outreach was also slashed from $100 million last year to $10 million this year. Every Republican effort to repeal and replace Obamacare this year has really been an attempt to slash health services to the poor and "undeserving." Of cournse, the middle class is adversely affected, as well. Since none of the efforts succeeded, Trump's goons will sabotage our existing healthcare system any way they can. How is it that any sane American votes for these people? Saw a Frank Luntz focus group with seven Hillary voters and seven Trump voters last night on 60 Minutes. Trump voters unswervingly support him after his first nine months. "Give him a chance!" they demand. Tax-Cut Tuesday: Let the Lying Begin!